— But suggested humans breathing as a larger problem than cars. AA spokesman Conor Faughnan told an Oireachtas Committee that “we are being singularly unfair to the private car” on climate change emissions, but his statements on this issue does not tally with figures provided by the Environmental Protection Agency (EPA). Faughnan was speaking at the Joint Oireachtas Committee on Transport’s discussion on “A Vision for Public Transport” on November 23, 2016. EPA figures, however, show that car-related CO2 emissions increased from 1990 to 2007, then stabilised and dropped to 2011, but then stabilised and rose in 2015. So, the statement that the private car “contribution to emissions has been steadily reducing” is overall false. 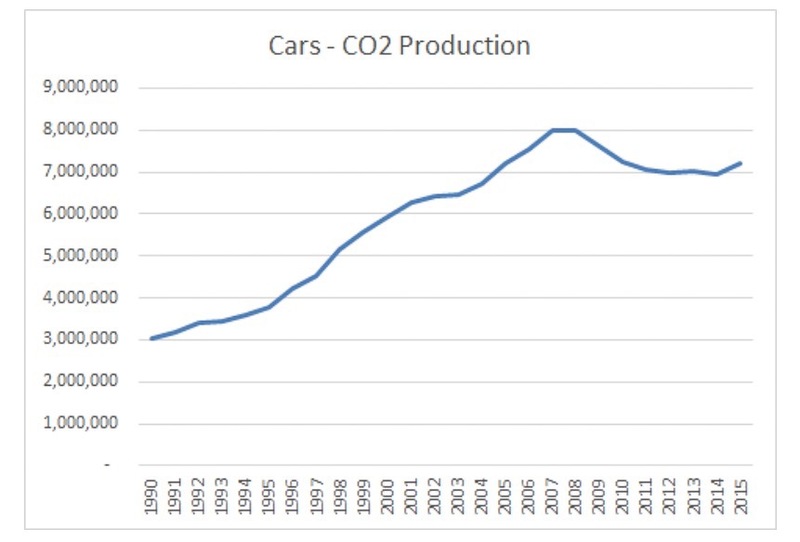 Cars are producing 239% of the CO2 they were producing in 1990 and 90% of what they were producing in 2008. IMAGE: Emissions from cars in Ireland by years. Chart based on EPA data. 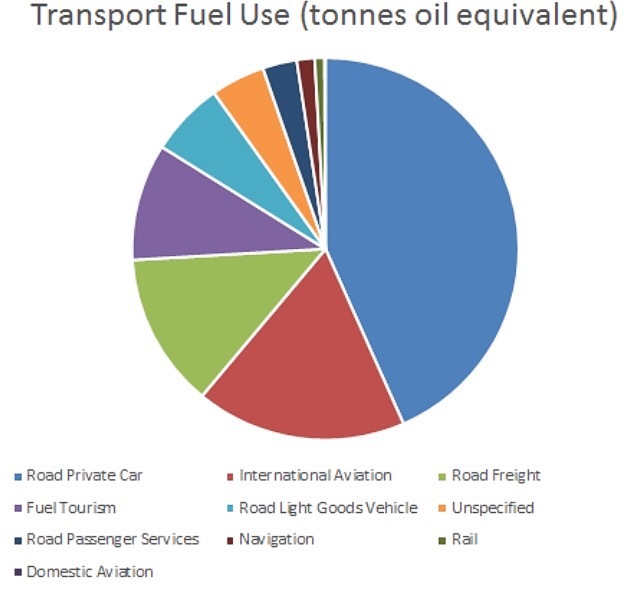 But, while Faughnan is correct that aviation is not counted, the idea that road freight is having a more notable impact compared to cars is not back up by the official figures which show that cars alone are producing 375% of the CO2 produced by HGVs (trucks) and buses combined. Irish Rail’s accounts in 2015 show that the company used 409,700,000 MWh of diesel fuel in 2015. That amounts to Irish Rail producing 111,725 tonnes CO2 — about 1% of the CO2 that road transport did. In the debate on public transport he said cars should remain prominent although not dominant. He used Amsterdam and Copenhagen among examples of cities which have better public transport and mentioned Dublin’s lack a metro railway, but did not mention how Amsterdam and Copenhagen started their major city centre car restrictions before their metros were constructed. CORRECTION: January 30, 2017 at 22:00: Our original fact check of what Faughnan said about emissions from a “decent sized family car” vs “what the family produce through breathing in a year” was an incorrect approach to take. What Faughnan said was incorrect, but our original correction was an incorrect level of correction. We are happy to make this correction. And what about NOx, ozone, particulates, noise, clutter, using up space, deaths due to collisions, injuries, obesity thru inactivity, etc etc. Good god, talk about putting spin on a topic. The whole approach of the motor transport business (vehicle makers, sellers, fuel extractors and lobbyists) is to underplay the detrimental effects made to our environment and society by the use of vehicles. Just like the tobacco business in the past and the drinks industry in the present do in relation to their known downsides. The recent VW emissions scandal is a case in point. The downsides are under-played because all of us drive and don’t want our use of the car to be subject to tighter regulation. Our politicians understand this so they are not inclined to act looking to even the near future. Conor Faughnan is entirely wrong to imply that human respiration contributes to increased CO2 in the atmosphere., unfortunately this post repeats the misleading thinking. Please can you correct the post or attach a note to clarify the point. The breathing of a family (or indeed the total of all humans and animals on Earth) produces no nett emissions at all; unlike burning fossil fuel, which continually and permanently adds to the CO2 accumulating in the atmosphere. It is simply extraordinary (or maybe not) that CF used this falsehood in testimony to the Dáil committee. The record needs to be corrected. As noted above, human breathing produces no nett emissions so this paragraph is wrong – best to correct it. And ask CF for his sources. @Paul — thank you to you and others elsewhere who have pointed out the issue, it is now corrected. I can’t believe how many think that Faughnan is the voice of reason in the car promotion lobby. He may not be a Clarkson level prick, but he is still a prick. As Citizen Wolf points out he completely ignores the other harmful pollutants of cars to pick on CO2 and then ignores the point that Paul Price made which is that the NET emissions of CO2 from humans is 0 since we are just moving around what is already there. It is inconceivable that Faughnan doesn’t have access to this information so he is deliberately omitting it, making him a liar as well as a prick. One additional inaccuracy. He insinuates that people constantly complain about the private car “as if it was the only thing contributing to emissions”. This is not true. People routinely criticise the environmental impact of air travel, the fact half the products we buy are shipped around the world and power generation. Once again, it is impossible to believe that Faughnan isn’t aware of that. The reasons people aren’t complaining about human emissions of CO2 are twofold. Firstly, as ably pointed out by others already, that it is wrong. Secondly, what exactly are we supposed to do about it? Does Faughnan think we should develop more efficient people? Is he suggesting population control? He is saying that because something we have no control over is bad, we should give a free pass to something we do have control over because it is not quite as bad. Because he loves his car and his whole career is based on promoting car use. A collective humankind holding of breath for that audacity is surely your only Man!